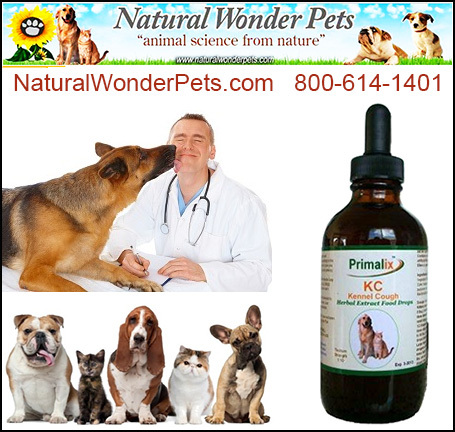 Primalix KC for Kennel Cough is an inspired formulation of USDA Certified Organic herbs that are specific for respiratory conditions including canine infectious tracheobronchitis or Bordetella. What Sets Natural Wonder Pets Apart From Competitors? At Natural Wonder Pets we make and sell only our own products so we know exactly what's in them. If the ingredients are not literally, totally, honestly natural, we won't make it or sell it. We use no GMOs, no fillers, no grains, no yeast, no gluten, no sugars, no binders, no excipients, no starches, nothing synthetic to cheapen the formula ... all products proudly made in America, all hand-crafted by our Master Herbalist and expert staff, all USDA Certified Organic or ethically Wildharvested, human grade, alcohol-free ingredients. Kennel cough is the common name for an upper respiratory disease primarily in dogs. The cause is generally a combination of bacteria and viruses infecting and irritating the sensitive lining of the dog’s airway, including trachea and bronchi. The condition is known medically as tracheobronchitis, canine infectious tracheobronchitis, Bordetellosis, or Bordetella. Kennel cough is very contagious and will infect a high percentage of dogs at some point in their lifetime. Fortunately, life threatening cases are rare and most dogs and cats will eventually recover on their own without drugs or vaccinations. With proper herbal medication the natural healing power of a pet’s immune system is brought back into balance, infectious agents are defeated, and damage to the tracheal lining is restored. How Do I Know If My Dog Has Kennel Cough? If your dog has a dry, hacking cough that just seems to go on for days, your dog likely has Kennel Cough! Air passing over irritated nerve endings in the dog’s airway cause a rough, dry, hacking cough often ending in a retching or gagging as if the dog is trying to clear its throat. This routine will be repeated every few minutes throughout the day and often into the night. Coughing may be accompanied by a watery nasal discharge. Make sure you get the dog to your veterinarian to find out, so that there aren’t other things going on, but if your vet finds it to be Kennel Cough, then we have help for your dog. Shouldn’t I Just “Do Nothing” and Let It Run It’s Course? If you had a product to help your dog, why would you want to do that? Imagine curing your dog of kennel cough - at home - without using dangerous drugs or toxic chemicals that can cause negative side effects and damage to deep organs. Why would you want to see your dog suffer or expose other family pets (like cats and other dogs) to the discomfort and illness of Kennel Cough when you can do something about it? Primalix® KC for Kennel Cough is an inspired formulation of USDA Certified Organic herbs that are specific for respiratory conditions including canine infectious tracheobronchitis or Bordetella. Up to five times more bio-available than pills or granules, our proprietary herbal extract will (1) Rush soothing relief to symptoms almost immediately, (2) Target and destroy invading pathogens at the root of the problem, and (3) Stimulate your dog’s own healing power from within, as nature intended. Due to the highly infectious nature of kennel cough, veterinarians advise owners to keep their infected dog isolated from other dog populations such as kennels, dog parks, veterinary offices and the general public. Primalix KC lets you heal pets at home in familiar surroundings, with your loving hands. Our 4 oz. glycerite (alcohol-free tincture) gives you twice the medicine the other brand sells you for about the same price. Having enough medicine to fully treat kennel cough can avoid relapse. What Are The Ingredients For Primalix® KC? Our extraction solvent for Primalix KC consists of our own proprietary blend of organic vegetable glycerin, apple cider vinegar, and crystal clear water which we ionize and purify through filters measuring one one-hundredth of a micron. We do not extract with alcohol, which is harmful to dogs and cats, nor with heat which "denatures" the very herbal constituents that do the healing. What Is The Dosage For Primalix® KC? NOTE: One "dropper" equals one squeeze of the black bulb (1 cc), which fills the pipette about half full. Refrigerate after opening. NOTE: Primalix KC ® is not recommended for pregnant or nursing animals. Primalix KC ® is most effective when given on an empty stomach. Insert dropper into pet’s mouth and squeeze bulb to discharge. Or, simply add to food as directed. Make sure your dog has plenty of fresh drinking water available (please use only filtered or distilled water). Give dosage evenly throughout the day, but avoid giving at the same time prescription drugs are given. Tincture strength 1:10. Average treatment time is 10 days. At just $39.95 (less than a trip to the vet) you can have REAL help to restore wellness to your dog. Don’t let your dog cough his or herself into exhaustion when real help is just a phone call away. Call today and let us help bring your dog back to maximum health— naturally!